Chosen wonderworker and superb servant of Christ, who pourest out in the latter times inexhaustible streams of inspiration and a multitude of miracles. We praise thee with love, and call out to thee: Rejoice, O holy Hierarch John, wonderworker of the latter times! Rejoice, thou who didst live in virtue from earliest childhood. Rejoice, thou who didst ever live in fear of God and do His holy will. Rejoice, thou who didst manifest the grace of God in numberless virtues. Rejoice, thou who didst mystically hear the distant prayers of those in distress. Rejoice, thou who wast filled with love for thy fellow men and didst do all possible for their salvation. Rejoice, thou who dost bring joy to all who pray to thee in faith and love. 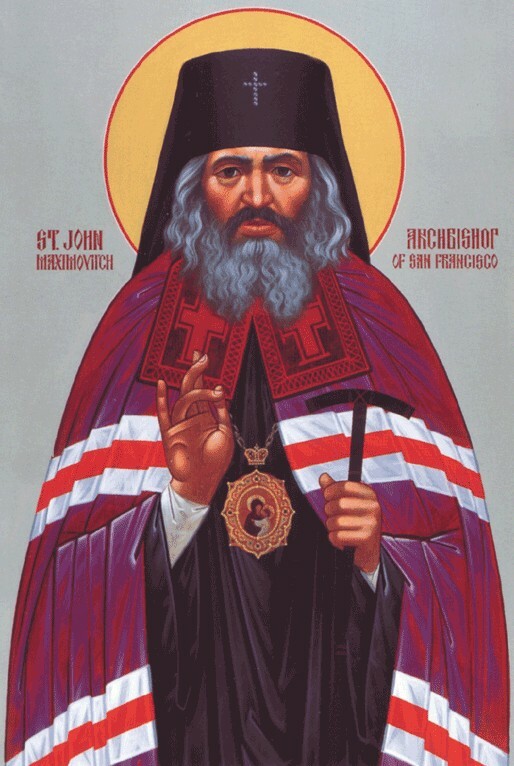 Rejoice, O holy Hierarch John, wonderworker of the latter times! Seeing the abundance and variety of thy virtues, O holy Hierarch, we see in thee a living source of God’s wonders in our time. Thou dost refresh with thy love and miracles all who cry in faith to God: Alleluia! Rejoice, firm stronghold of Orthodox Truth. Rejoice, precious vessel of the gifts of the Holy Spirit. Rejoice, righteous accuser of impiety and false doctrine. Rejoice, ardent doer of the commandments of God. Rejoice, severe ascetic who gavest thyself no repose. Rejoice, loving shepherd of the flock of Christ. By God’s mercy thou wast manifest as a father to orphans and instructor of the young, raising them in the fear of God and preparing them for the service of God. Therefore all thy children look to thee with love and cry out with gratitude to God: Alleluia! Rejoice, thou who didst protect thy children by thy constant prayer. Rejoice, thou who didst ever guard thy flock by the sign of the Cross. Rejoice, thou whose love knew no bounds of country or race. Rejoice, bright luminary beloved by all. Rejoice, model of spiritual meekness. Rejoice, giver of spiritual consolation to those in need. Bewildered by thy deeds of piety and love, we know not how to praise thee worthily, O Hierarch John. Thou didst travel to the ends of the earth to save thy people and to preach the Gospel to those in darkness. Thanking God for thine apostolic labours, we cry out to Him: Alleluia! Rejoice, enlightener of those in the darkness of unbelief. Rejoice, thou who didst follow thy people to the farthest East and West. Rejoice, fountain of miracles poured out by God. Rejoice, loving chastiser of those who have gone astray. Rejoice, speedy comfort of those who repent of their sins. Rejoice, support of those who go on the right path. Thou wast manifest as a vehicle of God’s power to stop the destructive forces of fallen nature, O holy Hierarch, preserving thy people on the island from the deadly wind and storm by thy prayer and the sign of the Cross. So preserve us also who cry out in wonder unto God: Alleluia! Rejoice, thou who didst stop the powers of nature from doing harm to thy flock. Rejoice, thou who providest by thy prayer for all in need. Rejoice, inexhaustible bread for the hungry. Rejoice, abundant wealth for those who live in poverty. Rejoice, consolation for those in sorrow. Rejoice, quick uplifting for those who have fallen. Thou wast manifest as a new Moses, leading thy flock out of slavery, O Hierarch John. Do deliver us also from slavery to sins and the enemies of God as we cry out to God: Alleluia! Rejoice, helper of all who call upon thee in faith. Rejoice, thou who delivereth from death and disaster. Rejoice, thou who preservest from lies and slander. Rejoice, preserver of the innocent from bonds. Rejoice, thou who foulest the attacks of the unrighteous. Rejoice, destroyer of lies and exalter of truth. O lover of the saints of East and West, thou didst restore to the Orthodox Church the saints of the West, of lands which had fallen away from the Truth. Now with these saints thou dost pray for us to God as we on earth cry out to God: Alleluia! Rejoice, new Martin by thy miracles and ascetic feats. Rejoice, new Germanus by thy confession of the Orthodox Faith. Rejoice, new Hilary by thy divine theology. Rejoice, new Gregory by thy love for God’s saints. Rejoice, new Faustus by thy gentle love and monastic fervour. Rejoice, new Cesarius by thy firm yet loving rule of the Church of God. At the end of thy life, O holy Hierarch, thou wast called to the New World, to offer there thy witness of ancient Christianity and to suffer persecution for thy righteousness, thus perfecting thy soul for heaven. Now marvelling at thy patience and longsuffering, we all cry out to God: Alleluia! Rejoice, thou who didst endure to the end and so attain salvation. Rejoice, thou who wast deemed worthy to die before the [Kursk] Ikon of the Mother of God. Rejoice, thou who didst keep thy faith and courage in the midst of unjust persecution. Rejoice, thou who didst labour to the end for thy flock and meet death sitting as Hierarch. Rejoice, thou who didst return through the air to be buried amidst thy flock. Rejoice, thou who workest wonders for those who come to thy Shrine with faith and love. All angel-kind rejoiced at thy soul’s ascent to their celestial home, marvelling at the wonders thou didst perform on earth through the action of the Holy Spirit, to whom we sing: Alleluia! Rejoice, divine palace wherefrom the counsel of the Good King is given. Rejoice, small and humble abode containing the spacious beauty of angels’ mansions. Rejoice, thou who didst gain a house not made with hands, eternal in the heavens. Rejoice, infirmary wherein all manner of diseases are divinely healed. Rejoice, chamber wherein thy holy labour of prayer was hidden. Rejoice, blessed temple of the Holy Spirit. Wishing to save the world, the Saviour of all hath sent a new saint among us and through him has called us out of the dark recesses of sin. Hearing this call to repentance, we unworthy ones in turn cry out to God: Alleluia! Rejoice, sight to the blinded. Rejoice, strength and life to those on the bed of death. Rejoice, God-revealed advice to those in doubt and confusion. Rejoice, refreshing water to those perishing in the heat of sorrow. Rejoice, loving father to the lonely and abandoned. Rejoice, holy teacher of those who seek the Truth. Thy life was a hymn to the Most Holy Trinity, surpassing others in thought, word and deed, O most blessed John. For with much wisdom thou didst explain the precepts of the True Faith, teaching us to sing with faith, hope and love to the one God in Trinity: Alleluia! Rejoice, radiance of divine wisdom to those in ignorance. Rejoice, rainbow of quiet joys for the meek. Rejoice, thunder to stubborn sinners. Rejoice, lightning of the zeal of God. Rejoice, rain of God’s dogmas. Rejoice, shower of theological thoughts. Grace hath been poured out in the last days upon us all. Beholding this grace come forth from a holy Hierarch who once did walk among us, let us receive it with reverence and thanksgiving, crying to God: Alleluia! Rejoice, new star of righteousness shining in heaven’s firmament. Rejoice, new prophet who was sent before the final unleashing of evil. Rejoice, new Jonah warning of the wages of sin. Rejoice, new Baptist drawing all to a life of prayer and repentance. Rejoice, new Paul suffering to preach the Gospel in the spirit of truth. Rejoice, new apostle whose miracles instil in us faith and awe. O our holy and most wondrous Hierarch John, consolation for all the sorrowing, accept now our prayerful offering that, through thy prayers to our Lord, we may be spared gehenna and by thy God-pleasing intercession we may cry eternally: Alleluia! Alleluia! Alleluia!